Clinton vs. Trump: Who's better for stocks and jobs? Your pocketbook may sway how you feel about the next president. With election day less than a week away, here is how Hillary Clinton and Donald Trump stack up on key money matters: jobs, taxes, stocks and the economy. Analysts are calling Clinton the winner on job creation. Under a Clinton presidency, the economy would add 4.7 million new jobs by 2020, according to an analysis by Oxford Economics. Other estimates are higher. 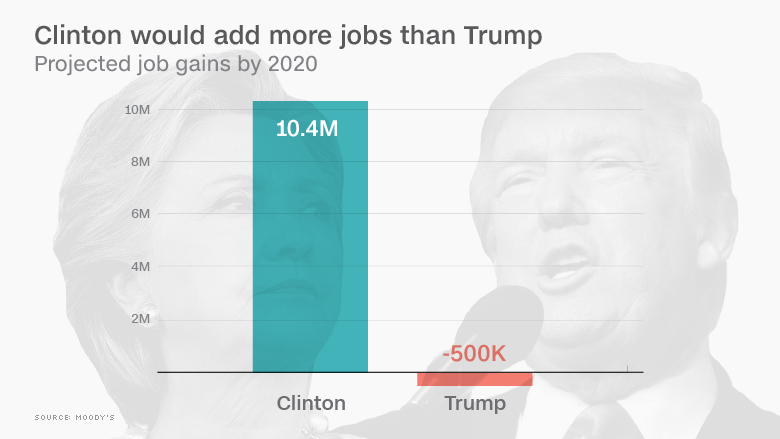 Moody's forecasts that Clinton would add 10.4 million jobs. The difference in the two forecasts stems from the assumptions about the impact of Clinton's immigration proposal to provide a pathway to citizenship. It is expected to boost employment and growth -- but experts differ over the extent and the time period of the benefits. Under Trump's policies, Oxford says America would add a mere 700,000 jobs by 2020, while Moody's expects a net loss of 500,000 jobs by the end of his first term. The forecasts for Trump assume his immigration and trade policies would be major headwinds for job growth. Trump says he will add 25 million jobs over a decade -- a claim that independent analysis hasn't been able to corroborate. It depends what you want -- pain now followed by gain later, or more money now followed by tough times down the road. Trump's tax plan would have a positive impact...until 2024. UPenn and the Tax Policy Center found that Trump's tax-cutting policies could boost growth in the short term. But lower tax revenue would lead to higher federal debt, which would hurt future generations even more than current projections. The same analysis of Clinton's plan came up with the opposite result: a headwind in the short term from higher taxes. But then there is the potential of positive effect in the long-term, when the tax revenue could be used to build new roads, bridges and highways. Wall Street wants Clinton to win. According to Macroeconomic Advisers, a Clinton win would boost the S&P 500 by 2%. That may not sound like much but it's better than the expected market nosedive if Trump wins. A Trump win would surprise markets, sending U.S. stocks down 8%, Macroeconomic Advisers forecasts. Trump is also extremely unpredictable, a trait that markets abhor. The Brookings Institution predicts a 10% to 15% stock market dive if Trump wins. Investors prefer Clinton because she is a known commodity. Plus if the Republicans maintain control of Congress, as expected, it would lead to more gridlock in Washington. Gridlock means a lower chance of new regulations -- and less headaches for big banks. However, no matter who wins, the day after the election usually tends to be rough. Bespoke Investments found that the average selloff the next day is about 1%. Trump promises big growth: as much as 4% a year. But experts doubt it's possible. Trump's policies would cost the economy to lose $1 trillion by the end of his first term, according to Oxford Economics (Trump's team calls Oxford's analysis "narrow and myopic"). Growth isn't expected to be spectacular under Clinton either, though the economy is expected to stay on track, they say. 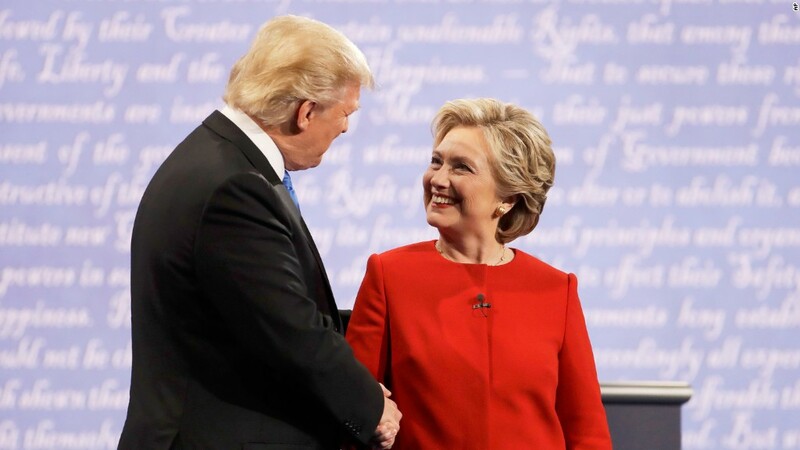 Clinton's immigration policy, which would theoretically expand the job market, would grow the economy, but only marginally more than if none of the current policies are changed, according to Oxford and UPenn data.